Physical Therapy Products, Physical Therapy Equipment, Hot and Cold Therapy Products, Message Tools and Light therapy systems. Scroll down to see our selection of Physical Therapy Products for sale. 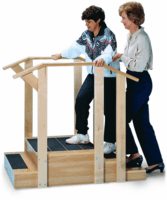 Physical therapy products are used by individuals and therapist to help maintain movement. We carry a large selection of physical therapy products including steps, wheels and stools, physical therapy parallel bars, massage tools and hot/cold therapy pads as well as light therapy systems. Physical therapy products are items concerned with identifying and maximizing a patient’s quality of life. Physical therapy products help with prevention, diagnosis, treatment /intervention, and rehabilitation of a patient. For a person with arthritis, cancer, Alzheimer’s, hip or joint replacement and balance disorders the incorporation of physical therapy products help with physical, psychological, emotional, and social well being..